The first think on our Magic Kingdom to do list is to make sure we get our one on one meeting with Mickey. I love that they changed things up and added a FastPass for a meeting. We were able to spend a lot more time with him this trip. And I was able to get LOTS of pictures of my idol. I can't get the smile off my face! I love meeting Mickey and it brings tears to my eyes! Lots of goodies from the stash were used to bring this page together. And a fun stash challenge from Kristi, which was to use glitter, chevrons and tape. 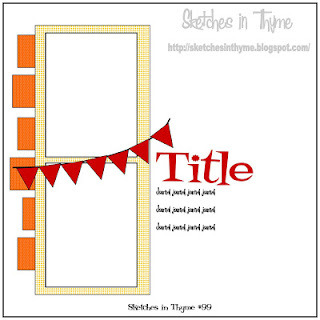 My title is glittered thickers, and I used lots of chevron patterned tapes. Then for an extra bit of glitter, I used a glitter mist spray on the background. Great Disney page and I love the use of the scattered stars around your title!! Thanks for working out with us @ ScrapFIT! Just adorable! I love the way you used the washi tape! Thanks for joining us at Sketches in Thyme!! I loved the colors, the layout fundobranco ..... beautiful, very obrigadapor participate in SIT! Very cute! I have been working on my Disney layouts as well! This looks terrific! Very nice LO: it's full of life and the colors are perfect with the photos. Thanks for playing along with us. Great page! I love the banner! Thank you for joining us at Sketches in Thyme! This is an awesome page! That title is perfect for this challenge :) Thanks for working out with us at ScrapFIT! wonderful disney page!!!! great banner also!!! way to go!! thanks sooo much for playing along with Sketches in Thyme!!!! Thank you for participating in the challenge sketch of SIT ...... Beautiful LO! Your Disney layout is fabulous! Thanks for playing along with us at Sketches In Thyme!